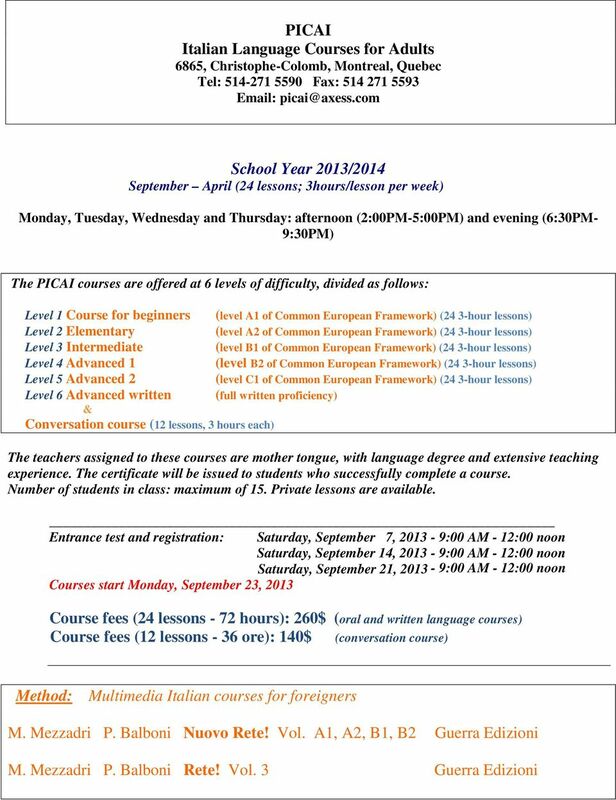 Download "PICAI Italian Language Courses for Adults 6865, Christophe-Colomb, Montreal, Quebec Tel: 514-271 5590 Fax: 514 271 5593 Email: picai@axess." 2 Communicative Inductive Method The courses are based on the modern communicative method with the way of inductive approach; they offer functional language knowledge for everyday communication, a multi-syllabus approach intended to enable the student to learn gradually and reach the targeted level of proficiency. Our mission is based on the following pedagogical and methodological principles: Create and maintain the most favorable and motivating environment Develop and stimulate student participation by focusing on every student s specific needs, making him become part of the learning process Factually associate the phonetics with the graphics of the word: meaning and message Favor the didactic dialogue to increase comprehension through repetition of the models of communication in everyday life Attain communicative abilities in different types of situations Simulate and recreate real-life situations for a student to be introduced to, first-person; teaching Italian as a living language Enhance vocabulary skills, comprehension and syntax through oral interaction Select and sequence linguistic forms gradually Teach and apprehend grammar rules and structures in the communicative context Assimilate vocabulary and structures in a meaningful and relevant context; then, reuse and reconstruct observed models in similar contexts Make the student aware of the difference between the communicative functions and grammatical structures for the same message in a given social context Student s language and cultural learning progress is an expanding spiral. Level One: Course for Beginners 24 lessons: the equivalent to Level A1 of the Common European Framework of Reference. Textbook: Nuovo Rete! Vol.A1; Units: 1, 2, 3, 4, 5, 6, 7, 8 Confirmation (positive and negative). Greetings. Personal identification. Ask and tell one s nationality and origin Thanking. Assenting and making excuses. Asking to repeat. Asking and giving telephone numbers and addresses. Asking for directions to a place and its description Formally introducing oneself to others. Exchanging personal information. Speak about one s occupation. Asking and giving information on personal possessions, hypotheses and abilities. Express a personal opinion; agree and disagree Personal and family relationships: speaking about acquaintances. Invite and accept an invitation. Likes and dislikes Describe the home. Describe places. Locate objects in space. Speak about provenance with di and da. Asking and responding the questions about time and date. Ask and respond about the date and time of events and actions. Describe one s daily routines and habits and their frequency. Talking about food, compiling the shopping list. Quantities, ordering in a restaurant or a bar. Offering. Asking and responding the questions about the needs/wants. Ask and respond the questions about the price. 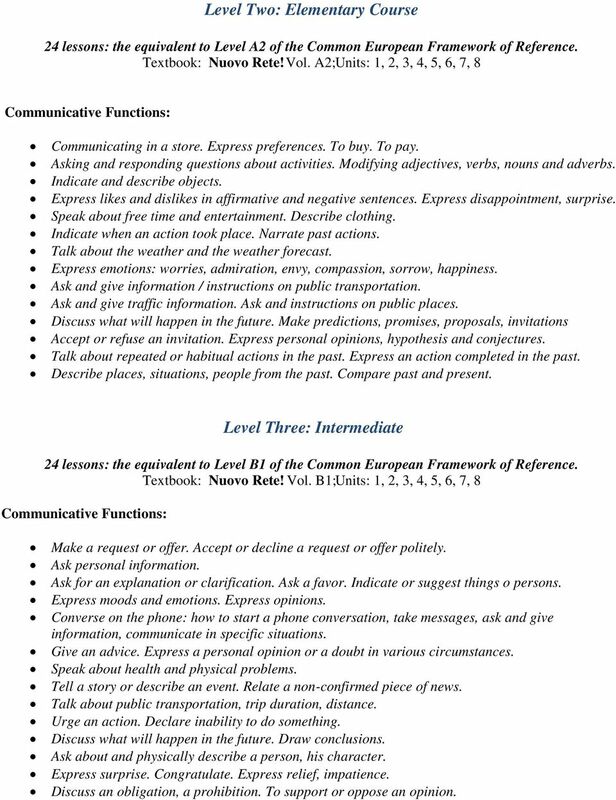 3 Level Two: Elementary Course 24 lessons: the equivalent to Level A2 of the Common European Framework of Reference. Textbook: Nuovo Rete! Vol. A2;Units: 1, 2, 3, 4, 5, 6, 7, 8 Communicating in a store. Express preferences. To buy. To pay. Asking and responding questions about activities. Modifying adjectives, verbs, nouns and adverbs. Indicate and describe objects. Express likes and dislikes in affirmative and negative sentences. Express disappointment, surprise. Speak about free time and entertainment. Describe clothing. Indicate when an action took place. Narrate past actions. Talk about the weather and the weather forecast. Express emotions: worries, admiration, envy, compassion, sorrow, happiness. Ask and give information / instructions on public transportation. Ask and give traffic information. Ask and instructions on public places. Discuss what will happen in the future. Make predictions, promises, proposals, invitations Accept or refuse an invitation. Express personal opinions, hypothesis and conjectures. Talk about repeated or habitual actions in the past. Express an action completed in the past. Describe places, situations, people from the past. Compare past and present. 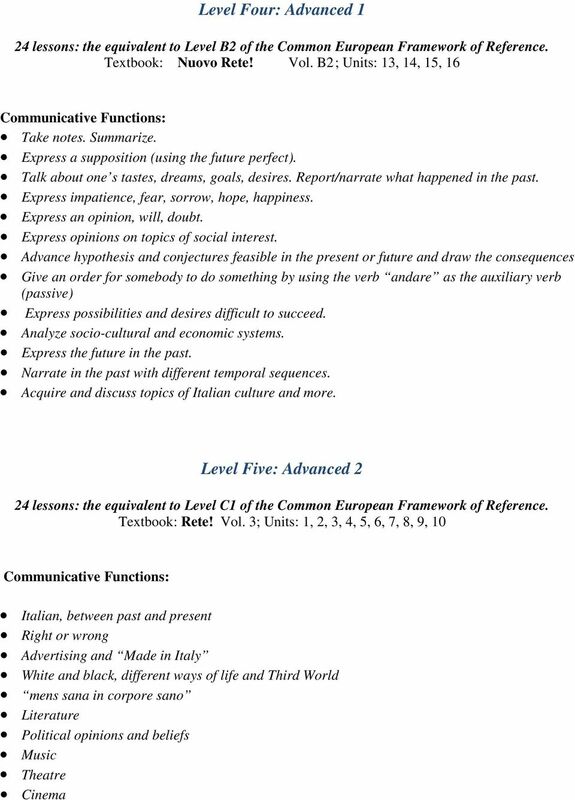 Level Three: Intermediate 24 lessons: the equivalent to Level B1 of the Common European Framework of Reference. Textbook: Nuovo Rete! Vol. B1;Units: 1, 2, 3, 4, 5, 6, 7, 8 Make a request or offer. Accept or decline a request or offer politely. Ask personal information. Ask for an explanation or clarification. Ask a favor. Indicate or suggest things o persons. Express moods and emotions. Express opinions. Converse on the phone: how to start a phone conversation, take messages, ask and give information, communicate in specific situations. Give an advice. Express a personal opinion or a doubt in various circumstances. Speak about health and physical problems. Tell a story or describe an event. Relate a non-confirmed piece of news. Talk about public transportation, trip duration, distance. Urge an action. Declare inability to do something. Discuss what will happen in the future. Draw conclusions. Ask about and physically describe a person, his character. Express surprise. Congratulate. Express relief, impatience. Discuss an obligation, a prohibition. To support or oppose an opinion. 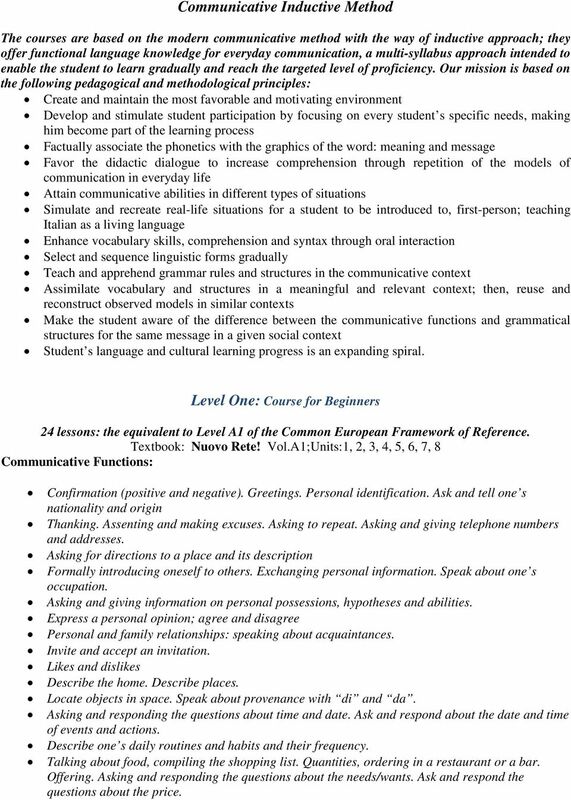 5 Level Six: Advanced Written 24 lessons: the equivalent to Level C1 of the Common European Framework of Reference. With particular emphasis on writing proficiency The objectives of this course is to enrich and refine the student s vocabulary and consolidate and develop the grammatical and syntax forms and structures, to ultimately equip the student with the fundamental tools and techniques for producing clear, well structured written works. Choose the style, the language register and vocabulary appropriate for the occasion, and whether performing simple or more complex communicative tasks, place emphasis on the points that are important for conveying the message. In particular, the written composition draws on the linguistic analysis of various sources, from those belonging to the literary canon to others from the spheres of journalism and literary criticism. 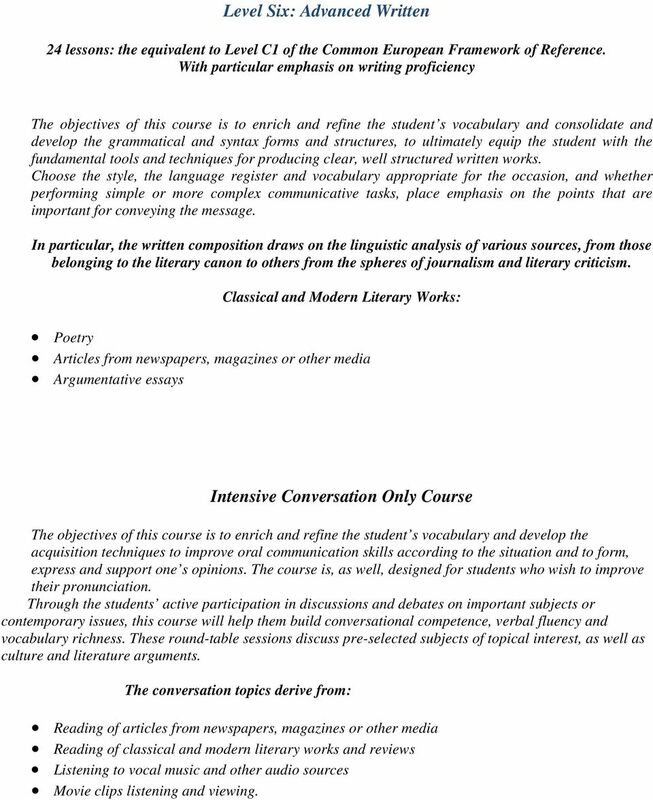 Classical and Modern Literary Works: Poetry Articles from newspapers, magazines or other media Argumentative essays Intensive Conversation Only Course The objectives of this course is to enrich and refine the student s vocabulary and develop the acquisition techniques to improve oral communication skills according to the situation and to form, express and support one s opinions. The course is, as well, designed for students who wish to improve their pronunciation. Through the students active participation in discussions and debates on important subjects or contemporary issues, this course will help them build conversational competence, verbal fluency and vocabulary richness. These round-table sessions discuss pre-selected subjects of topical interest, as well as culture and literature arguments. The conversation topics derive from: Reading of articles from newspapers, magazines or other media Reading of classical and modern literary works and reviews Listening to vocal music and other audio sources Movie clips listening and viewing. WHY DO WE NEED GRAMMAR? Study Plan Bachelor s in Spanish and English Faculty of Foreign Languages University of Jordan 2009/2010 Department of European Languages Faculty of Foreign Languages University of Jordan Degree: B.A. GESE Elementary steps Guide for teachers, Grades 4 6 What is Trinity College London? Trinity College London is an independent international exams board, fully accredited in England as an awarding body. English Pre-intermediate Portfolio Practice Annie McDonald & Mark Hancock CEF 4 Contents Introduction What is a Language Portfolio? 3 The Language Passport What is a Language Passport? 4 How do I use it?